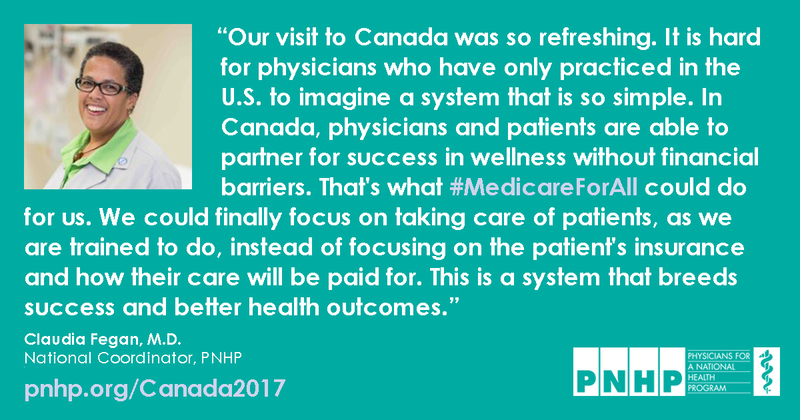 Shortly after introducing the “Medicare for All Act of 2017,” Sen. Bernie Sanders (I-Vt.) traveled to Canada to gain new insight about its single-payer health care system. He was accompanied by several medical professionals, including PNHP national coordinator Dr. Claudia Fegan and national board member Dr. Richard Bruno. During this trip, Canadians expressed pride in a system that covers everybody while spending far less per capita than their neighbors in the U.S. Patients and doctors alike expressed dismay at the notion that Americans could be bankrupted by a serious illness, and that many uninsured and under-insured Americans forego care altogether. 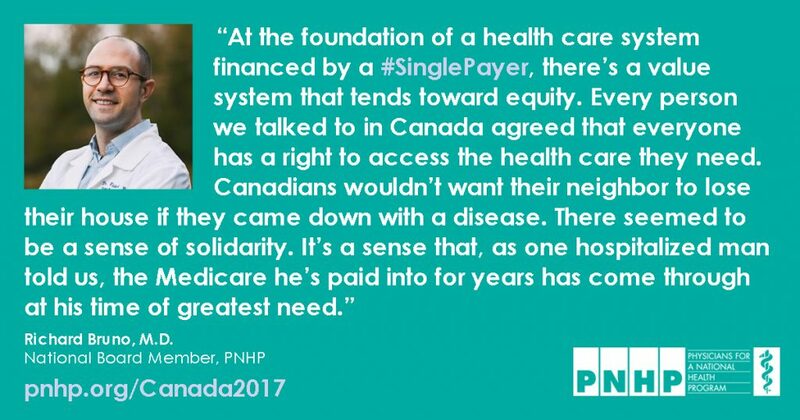 Sen. Sanders concluded the trip with a rousing speech at the University of Toronto on Sunday, October 29, which can be viewed above. Footage of the event starts at 12:20, Sen. Sanders takes the stage at 28:40, and Sen. Sanders participates in a brief interview with noted Canadian activist Dr. Danielle Martin at 1:04:00. Clockwise from upper-left: Sen. Bernie Sanders, Dr. Claudia Fegan & Dr. Danielle Martin tour Mt. 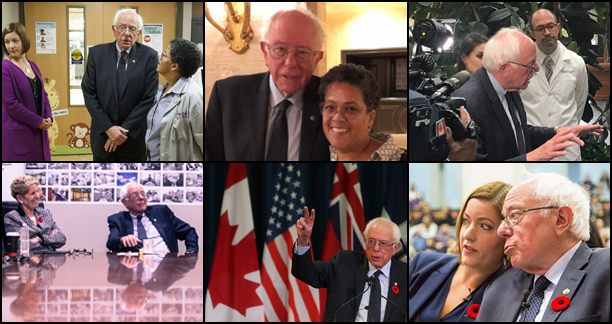 Sinai Hospital in Toronto; Sen. Sanders & Dr. Fegan; Sen. Sanders addresses U.S. & Canadian press w/ Dr. Richard Bruno; Sen. Sanders & Ontario Premier Kathleen Wynne; Sen. Sanders speaks at the University of Toronto; Sen. Sanders & Dr. Martin. Photo credit: office of Sen. Bernie Sanders, Vox, and New York Times.